The Acumen's custom-designed woofers, silk tweeters and meticulous material selection create its lush yet accurate signature sound. The bi-amplified Acumen has the best-in-class wattage output with a total of 98 Watts (RMS). Phonic's unique steeple-shaped enclosure minimizes acoustic inaccuracies found in standard box-shaped speakers and maximizes bass extension, acoustic sweet spot, transparency while reducing common abnormalities such as resonance peaks, diffraction and port turbulence. 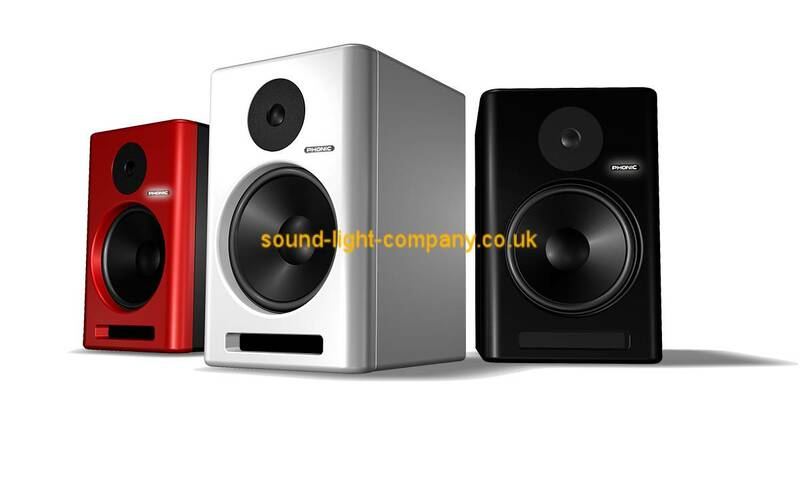 So whether you are looking for an accurate monitoring system for recording, a pair of speakers for your DJ booth, or even a set of premium speakers for music playback, the finely tuned Acumen series will be a delight to your eyes and ears. Since its inception in 1972, Phonic has become a leading manufacturer of professional audio products permanently perched on the cutting edge of both analog and digital technology. By the early 1980s Phonic was the number-one producer of DJ mixers, supplying over 85% of the total units sold worldwide. Phonic didn't stop there. Since then, Phonic has expanded its manufacturing expertise into all areas of professional audio. Phonic deliver products including digital mixers, audio analyzers, precision speakers, and wireless technologies that give the sound engineer industry-leading usability, performance, and dependability. Phonic's global reach extends across 50 countries and we proudly manufacture our products in 100% owned, ISO-certified factories.